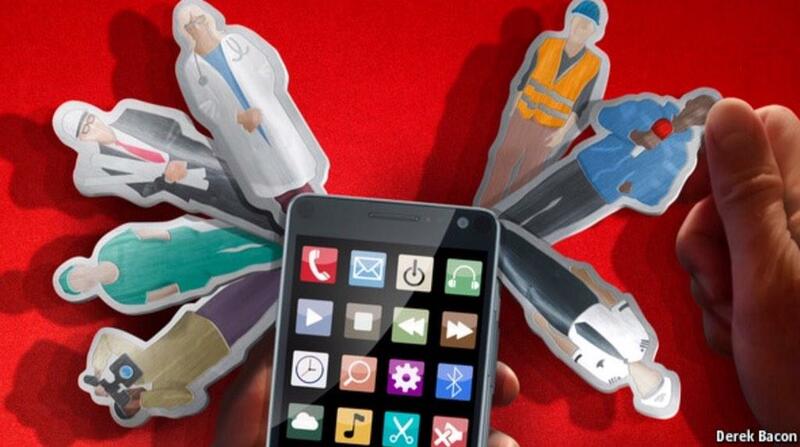 Photo credit to: Derek Bacon from the Economist article “Future of work – There’s an app for that” , January 2015. Visitor blog by our advisor Thorgeir Einarsson, Elevera Advisors. Hate or dig your gig! Whilst established taxi drivers in London, Paris, Madrid and Berlin complain about Uber stealing away their customers, the same on-demand service is a godsend for unemployed drivers in South Africa and other emerging markets. Why is this? Well, the vast majority of African nations’ populations are unemployed or self-employed. Very few companies are hiring permanent staff so self-reliance and working together with others are often the only means of survival. For this reason, running a small business or offering temporary work on a gig-by-gig basis is the way of life for millions of people on the African continent. With this as a backdrop, Africans clearly love smartphones and on-demand marketplaces, as it’s a great alternative to finding new work without having to sit by the road-side at traffic lights with a for-hire-sign, as many artisans actually do! Customers love on-demand services too! I have a friend in South Africa who has his children picked up from school and friends’ houses in Uber cars that they track and trust. They feel good about supporting new drivers as they turn up on time and drive their family home safely. This recent trend of temporary work is now spreading to developing nations where a combination of low economic growth and ridged employment laws have made permanent jobs something of the past. Especially for young people who enter the work place for the first time. The future spells freelance, on-demand! In Europe alone we now have an estimated 8.9m independent workers. Another recent report indicates that a massive 34% of the total US workforce are in some form of freelance job, from blue-collar to white-collar workers. Freelancing can offer a new way of life that complements other part-time work and offers flexible working hours with the opportunity to explore new prospects. According to a recent report jointly published by the Kauffman Foundation and Roosevelt Institute on the American Economy 2040: “The job market will consist of part-time assignments, portfolio careers, and entrepreneurialism. Instead of day-in, day-out work consisting of much of the same responsibilities…a “career” will instead be composed of thousands of [short-term] assignments spread out over a lifetime”. US based on-demand services like TaskRabbit and Wonolo have brought about new means of earning income for people doing small tasks for households and companies. This typically involves household and garden chores at a reasonable price and, in some cases, same hour service. It’s not just in the US we see these job-matching services, but also in emerging markets as noted above. An innovative South African startup called Domestly is offering trusted on-demand cleaning services via a mobile app and is growing steadily. Food delivery services are popping up everywhere to offer home-delivery from your chosen restaurant, often delivered by temporary staff on their scooters. Professional and creative work is now offered via services like UpWork who claim to have 12 million freelancers registered and 3 million tasks executed annually. Who really benefits form the gig economy? So is this a good thing? Who really benefits from this on-demand gig model, apart from customers getting better, faster service at a lower price? What about people who are new to the workplace or who maybe have lost a long-term permanent job? Do they now need to quickly become self-reliant and entrepreneurial to not have to rely on someone employing them full time? It seems that this new future of work scenario means that all the usual perks, pension plans and medical insurances will need to be self-sourced, opening up a new market for financial and medical services providers. But is this independent work-style really for everyone? Will it not lead to stress and burn-out? Who looks after the interest of the temporary workers to ensure that they are not turned into a new generation of temp-slaves? What is needed to survive in this new time of giganomics so that everyone is benefitting, not just customers and on-demand platform providers? These are big questions that will no doubt challenge politicians to review and modernize current labor law policies designed for the past era of permanent jobs. Who is the Stig of the gig? On the other hand, should maybe companies also be concerned that the very best talent is choosing freelancing instead of being bound to one single employer? Retaining high quality individuals by offering incentives will probably become a trend as an alternative to full employment. Changing times indeed for both employers and employees! Confident and experienced professionals going freelance often develop their skills by shifting or “slashing” between various contracts and can enjoy choosing their own bosses/customers. It’s easier to secure short-term project work if you have a strong CV, customer references and proven skills developed over years. At the same time, competition for work is harder than ever through these various on-line marketplaces and positive customer reviews are key to winning new gigs. There is no time to relax in the new gig-based marketplace. You’re only as good as your last assignment. No one knows this better than freelancers or anyone selling services via on-line marketplaces with transparent customer reviews. Youth unemployment – politicians’ biggest embarrassment? Maybe the young generation is the most vulnerable entering this “new brave world” of short term gigs and temporary work? What if you don’t have work experience or customer references? Unfortunately, the general lack of permanent work is hitting young people much harder than people already in employment. The main reason in Europe is often various labor laws that were designed over 20 years ago to provide job safety for the ones who came in first, passed their probation time and earned their company pensions over time. We see this happening in countries like Sweden, Finland and France to mention a few, where turnover of permanent staff is very low. Politicians in these countries are under pressure to reform these laws but trade unions do not want to see change, as these very laws protect many of their members. Denmark is a leading European exception that introduced more fluidity to their rules for hire and fire, whilst maintaining high unemployment benefits and trade union memberships. Today they boast one of the lowest youth unemployment rates in Europe at 11.9%. There is certainly something to be learned from the Danes! At present, the average European youth unemployment rate is an astonishing 18.2%. Countries such as Sweden, Finland and France that exercise ridged and old-fashioned laws, have higher rates of unemployment between 20-25%. The PIGS countries (Portugal, Ireland, Greece and Spain) are leading this embarrassing league with youth unemployment between a staggering 25-50%, although the numbers are slowly coming down. The huge influx of refugees over the past years has exacerbated the situation and put increased pressure on politicians to find pragmatic solutions to integrate newly arrived individuals into meaningful jobs and local language education. The Intergenerational Foundation (if.org.uk), a UK-based non-political think tank refers to the young people in Portugal, Italy, Greece and Spain (PIGS) in their Fairness Index 2016 report as the “lost generation”, when describing the grave unemployment situation. On-demand mobile temp work – the fastest way to get a job? So how can modern on-demand tech help combat youth unemployment that embraces all backgrounds? This is one of the biggest societal challenges that the western world has experienced in decades. But there is hope! A Finnish startup by the name of WorkPilots launched a new on-demand mobile service in 2016. It’s designed specifically to help youngsters in Europe to get a foot into the workplace. The project has been extremely successful with 6,000 young individuals already signing up to the service, including unemployed youths and students looking to make extra money and gain work experience. What’s noteworthy is that the local municipalities in over 15 Finnish cities have embraced the WorkPilots job-matching mobile app enthusiastically, as a complement to their traditional job centers. The incentive for local government to get young people into jobs is clear: they don’t have to pay a penalty to the state government if youngsters are employed. We are talking about €400 million (2015) in unemployment penalties in Finland alone! WorkPilots takes care of all the income and sales taxes associated with temporary work, and makes sure that all workers are treated respectfully and paid above minimum wage on time. As a result, municipalities themselves have started to buy hours of services from the WorkPilots’ pool of talent and over 100 NGOs in Finland has followed suit including global youth organizations like YMCA. Private households and commercial companies are joining in and proudly sport the WorkPilots logo on their web-sites to show that they are supporting the young workforce! Fighting youth unemployment – one gig at the time – an impact investment opportunity! WorkPilots have received grants from the Finnish innovation funding agency Tekes to replicate their success in other European countries, such as PIGS, that suffer from high youth unemployment. WorkPilots is a great example of a for-profit startup with huge social impact. The young company is now inviting private investors to help expand this winning concept to other European countries. We see more and more venture capitalists wanting to do good while making money with such impact investments! This co-creative model of private, public and private partnership (PPP) is the way to go, as opposed to initiatives that just maximize the benefits for companies using cheap labor or on-line market places having no regard for the working conditions or tax situations for their freelancers. We have seen the backlash from Uber drivers when their pay has been affected without them being able to control their earnings. TaskRabbit had the same experience when they started to introduce an automatic fee algorithm in 2013 that was based on supply & demand, leaving workers with no control of their income. Involving municipalities and agreeing transparent tax of new on-demand services up-front ensures that everyone is being treated respectfully and motivates stakeholders to be part of a system that is fair for everyone involved. Local municipalities and governments are still trying to figure out how to apply tax rules on this new phenomenon of asset-less brokers of on-demand services. It is just a matter of time until forward looking politicians will adjust tax rules pragmatically, as the enormous power of the on-demand economy will simply not go away. Especially as it generates tax with more people participating in the economy and paying their fair share of taxes. In conclusion, there is no way we will be able to stop innovation in the on-demand services economy or people wanting to become freelancers for life. It’s up to governments, businesses and individuals to come together to find fair and effective ways to ensure that no one is taken advantage of. It starts with the providers of the on-demand service to build services that are equitable in all aspects. Such fair services only make sense, as users will otherwise abandon on-line marketplaces that do not take their social responsibility seriously. It should be a self-regulated imperative for everyone involved. Inclusive on-demand work-matching services like WorkPilots will be a potential remedy to give youth hope again for a future. To be part of and contribute to society is a human right. To use technology to help save a “lost generation” is probably as good as any innovation I can imagine. The youth is our future and they need to feel that technology will help them control their own destiny, earn their own way, pay fair tax and be happy to be part of a community. Grown-up freelancers should also enjoy the same respect and especially the ones just entering this new life of independent temporary work. On-demand services in a gig-economy can be a true win/win for everyone, and as customers we also want to be sure that the people behind the services are happy and treated with respect. I’m curious about your view on this important topic and examples of other socially responsible initiatives that are leading the way in the new era of freelance economy. Disclaimer: WorkPilots (Finland) and Domestly (SouthAfrica) are advised by Elevera Advisers. Please feel free to contact me should you be interested in learning more about these companies, growth tech investments, M&A advice, strategic market positioning or blog posts on related topics.